Respecting and Enhacing Brand Voice Through Advertising | The Next Thinc. I am admittedly biased on this subject given we handled this account for six years or so at Element 79, but they’ve been flogging variations of “Go Humans Go” for over a year and as much as I genuinely respect Goodby’s creative and planning excellence, I can’t think of a more ill-conceived campaign for the Quaker brand. It is a new voice for the brand and one that is no doubt attention getting. But so is belching the National Anthem. Attention-getting creative still must relate to some consumer benefit or else it’s entirely dismissable. A new consumer voice still must feel somehow authentic to the brand or else it consumers won’t believe it. What’s been sacrificed here for no discernible reason, is brand voice. Perhaps some new people on the brand team consider things like ‘trust’ and ‘wholesomeness’ too passive… Perhaps they wanted to do something kicky that the kids might like… But whatever their intent, pursuing it this way destroys the trusted Quaker brand voice. 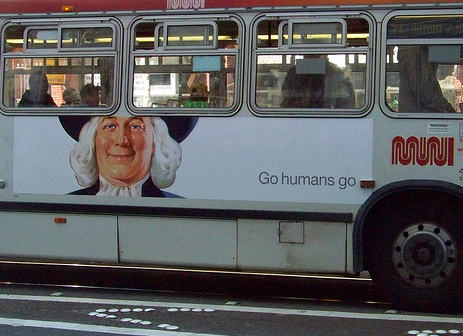 Putting “Go Humans Go” above Larry’s grin literally re-positions the trusted Quaker as a robot, a superior lifeform patronizingly looking down on a lesser species, like a representative for some semi-benevolent alien race. That’s interesting, but not particularly relevant. And it sure isn’t human or empathetic or even trustworthy. I mean, does that make you want to Facebook friend him? Change is often necessary for brands. But I doubt this is change anyone can believe in. All of your former clients are floundering without you. The Pepsi Logo scam, Tropicana packaging debacle, G (whatever that is) and now Quaker. Did you guys put some kind of Billy Goat curse on them? So read my Facebook status after the first time I saw the line. That was months ago. I stand by my original impression.